Alfred Hitchcock Presents was known for its twist endings, and it follows that the stories its episodes were based on would tend to feature twist endings as well. "Guilty Witness," by Morris Hershman, is an example of a story whose ending is its strongest feature. 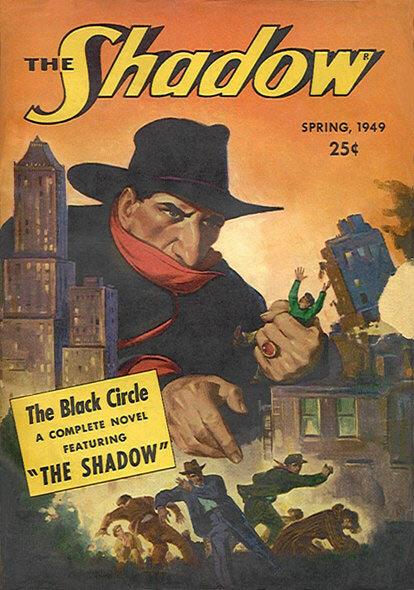 First published as "Innocent Bystander" in the spring 1949 issue of Shadow Mystery Magazine (the next to last issue of a pulp that had run for 18 years), the story was later anthologized in Butcher, Baker, Murder-Maker, a 1954 collection sponsored by the Mystery Writers of America and edited by George Harmon Coxe. It was in this collection that the producers of the Hitchcock TV show spotted the story, recalled Hershman, and they contacted the MWA for his address in order to buy the rights. Hershman's introduction to the story states that his father had been a pharmacist and so he decided to write a story involving a pharmacy. In the tale, Stanley Krane is a married man who runs the Express Pharmacy and whose customers include Mrs. Amelia Verber, who lives in apartment 3A of the building where Krane and his wife live on the ground floor. Mrs. Verber is described as "a sickly-looking woman with tea-colored hair" and she is married to a man who beats her and leaves visible bruises. "Her shrieks had caused my wife and me dozens of sleepless nights," says Krane, the narrator. Mrs. Verber asks him for a large carton to store some books. Krane's wife "can't stand" Mrs. Verber and remarks that "If I were married to [her] I'd beat her up day and night." Mrs. Krane's attitude strikes me as strange and it is not until the end of the story that it makes sense. One night, the Kranes hear screaming from the Verber apartment, screaming that is suddenly cut short. The next day, Mrs. Verber comes into the drugstore and drops her money when Krane asks her how her husband is. No one sees Mr. Verber for the next couple of weeks. Mrs. Krane makes a series of observations about Mrs. Verber's behavior that lead her to suspect that she may have murdered her husband. The Kranes receive a visit from a police detective named Harrison, who pretended to be from the Board of Health in order to search the Verber apartment. He received a tip about Mr. Verber's disappearance but cannot explain where the dead body has been hidden: it was not in the apartment and the neighbors would have seen Mrs. Verber removing it. When Krane delivers medicine to Mrs. Verber and notices a large pile of books, he recalls the carton he gave her and thinks that the body must be hidden inside it. He and his wife accompany Harrison to the basement, where they find the carton containing the dead man's body. "She stiffened and shrieked, her eyes glinting, her teeth bared as she jerked away from Harrison, long fingernails outstretched, and before any of us could make a move she was scratching, screaming, kicking, clawing at my wife!" It's a rare story that can succeed in postponing a twist ending until the final words, but "Guilty Witness" accomplishes this feat. The ending is such a surprise that the reader is forced to go back over the story to see if Dorothy's name was ever mentioned before (it wasn't) and if there were any other clues to her true role as a not so "Innocent Bystander" (the story's original title) or a "Guilty Witness." Her strange defense of Verber the wife beater and her dislike of his pathetic wife make more sense when one realizes that she was the man's lover and the woman's rival. "Guilty Witness" is a fairly good story with a great twist ending. It was one of the first stories written by Morris Hershman (1926- ) to be published. Hershman is a very prolific author who is not well known. In a career that spans over 60 years, he has written over 100 published short stories and over 70 novels, using a slew of pen names such as Sam Victor, Jess Wilcox, Evelyn Bond, Arnold English, Norman Hunt, Lionel Webb and Janet Templeton. 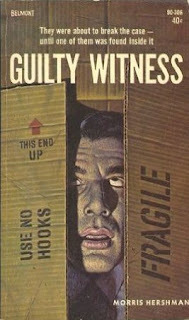 He has written books in many genres of fiction, but his very first novel, published as a paperback original in 1964, was none other than Guilty Witness which, from descriptions found online, appears likely to be a reworking and expansion of the same story that served as the basis for the first-season Alfred Hitchcock Presents episode of the same title. 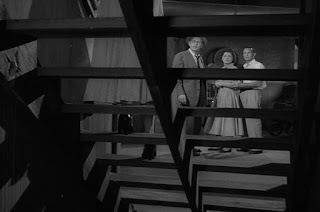 This would be the only episode of the Hitchcock series to be based on a story by Hershman; his only other credit on IMDb is for a 1960 Canadian TV series called The Unforeseen. Robert C. Dennis adapted "Guilty Witness" for television and it was broadcast three weeks after Dennis's "Our Cook's a Treasure" on CBS on Sunday, December 11, 1955. Both episodes were directed by Robert Stevens. In adapting the story, Dennis faced a challenge: how to hide the identity of the main character's wife as the motivating force for murder while telling the story in pictures rather than in words. I think that the episode fails to pack the same punch that the short story does for a variety of reasons, though Dennis's teleplay does correct one glaring error. In the TV show, Krane runs a grocery store rather than a pharmacy; the change is unimportant and one wonders if the producers had a grocery store set handy at the time of filming. Early in the episode, Stanley walks into a baby carriage that is parked in front of the hall telephone. Director Stevens positions his camera low and in front of the carriage, putting it in the foreground and drawing the viewer's attention to it. Krane complains about the carriage to Mrs. Verber and suggests that she hang a red lantern on it. The carriage will be of central importance later in the show and Dennis and Stevens make a point of it early. A subtle moment occurs in a scene where Mrs. Verber visits the store after the big fight with her husband. Stanley suggests that she buy some of the candy that her husband always buys for her and her brief hesitation before agreeing tells the viewer that she never received any of the candy from her husband. Back at home, Krane delivers the empty carton to Mrs. Verber's apartment. 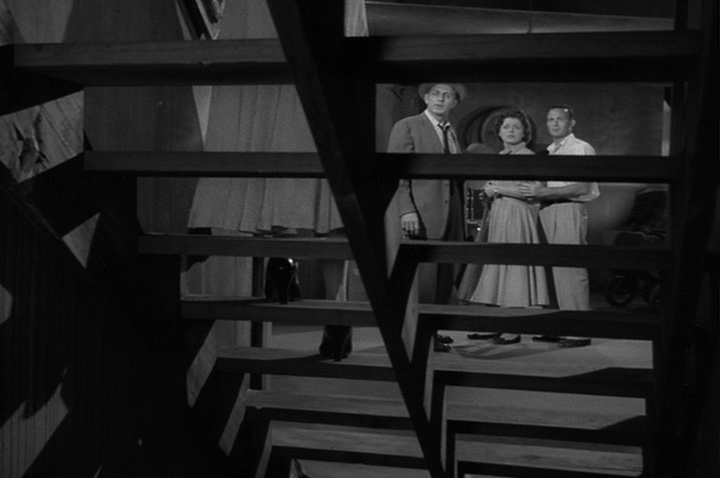 Once again, Stevens uses a low angle shot to focus attention on an object. This is followed by another shot of the carton as Mrs. Verber's hand reaches out and pulls it inside the apartment. We have now been asked to focus on two items: the baby carriage and the carton. Harrison is not known to Kramer as he was in the story, though Kramer quickly figures out that the man is no Board of Health inspector. As in "Our Cook's a Treasure," we witness a married couple sitting in their living room and watching TV; by 1955, this was becoming a common activity and one that could be depicted in fictional programs as something everyone was doing. "Guilty Witness" provides a good evocation of its characters' urban environment, a place of poverty and despair where people live on top of each other and a look out the window yields a view of garbage in an alley. The error in Hershman's story that is corrected in Dennis's script is one of odor: in the story, the body has been missing for more than two weeks before it is found, while in the TV show it's only a matter of days. The characters in the TV show sweat and fan themselves, making it clear that the story takes place in the summer in New York City, and if Verber had really been murdered and his body stored in the basement it would not have taken long for the smell of decay and decomposition to make the location of the corpse obvious. Hershman allows the body to be missing for too long and does not account for the stench; Dennis does not make this mistake. For anyone familiar with the story, the TV show takes an unexpected turn: Krane and Harrison go into Mrs. Verber's apartment, find the carton and cut it open--and all that they find inside are toys! 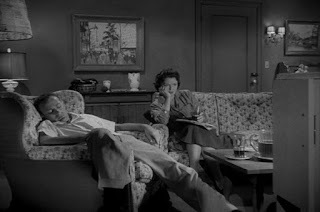 Stevens again forces the viewer to pay attention in a scene between the Kranes when Stanley tells his wife that he thinks Verber is not dead; the camera focuses in on her hands as she hesitates while pouring from a pitcher to a glass. There have now been shots pointing to three clues: the carton (a red herring, as it turns out), the baby carriage and Mrs. Krane. The show's final scene occurs in the basement but, unlike what happens in the story, Harrison and Krane find the dead body in the baby carriage, which has been moved from its position in the hallway to a spot in storage. Mrs. Verber comes down the stairs and Stevens places his camera behind the stairs so we focus on her legs as she descends. Instead of the use of the unfamiliar name "Dorothy" and the final attack on Mrs. Krane, the revelation that she was the dead man's lover is accomplished by Mrs. Verber suddenly remarking, "It wasn't his fault. It was yours!" and the camera cutting to the face of Mrs. Krane. The surprise is not as effective as it is in Hershman's story, but I'm not sure there was a way that Dennis and Stevens could have accomplished the same effect visually. "Guilty Witness" is an unremarkable episode with some directorial flourishes by Robert Stevens; the cast is comprised of four main characters whose performances verge on bland. Judith Evelyn (1913-1967) receives top billing and plays Mrs. Verber as a tired and beaten woman whose murder of her husband and hiding of his body are not consistent with her defeated personality. 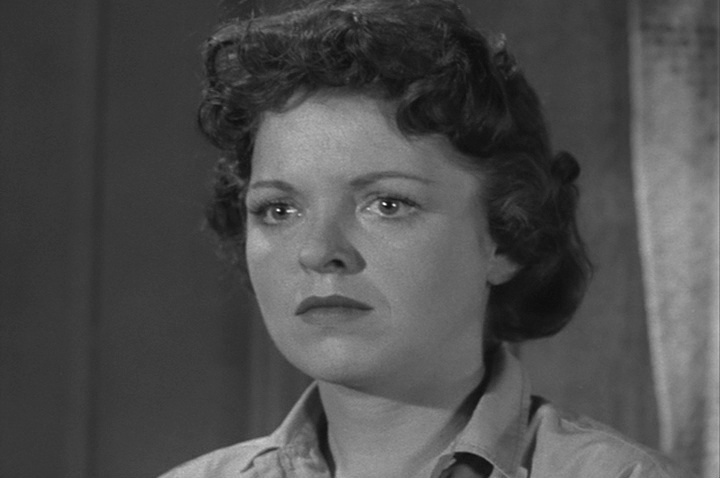 Born Evelyn Morris, the actress was in movies and on TV from 1946 to 1962, appearing twice on Alfred Hitchcock Presents and once on Thriller. 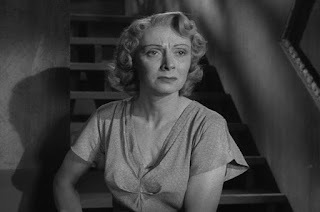 Her film roles included William Castle's The Tingler (1959) and a memorable performance as Miss Lonelyhearts in Hitchcock's Rear Window (1954). Kathleen Maguire (1925-1989) receives second billing; she plays Mrs. Krane and had a long but unremarkable career on screen from 1949 to 1986, appearing three times on Alfred Hitchcock Presents. 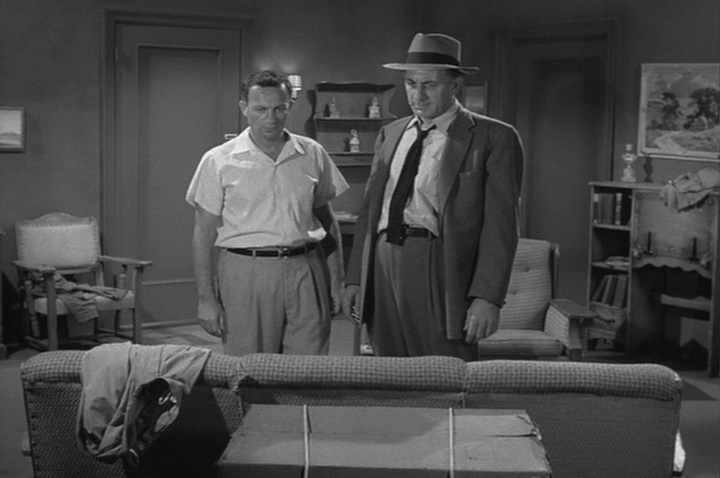 Playing Stanley is Joe Mantell (1915-2010), in one of his two appearances on Alfred Hitchcock Presents. 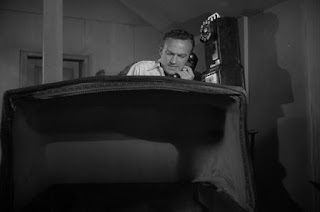 He was on screen from 1947 to 1990, appeared twice on The Twilight Zone and had a role in Hitchcock's The Birds (1963). Film fans will best remember him for delivering the final line in Chinatown (1974): "Forget it, Jake, it's Chinatown." 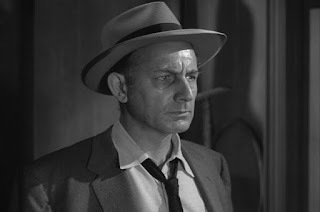 Finally, Robert Simon (1908-1992) plays Harrison, the police detective. 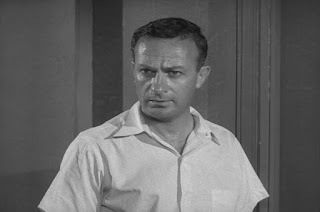 Simon was on screen from 1950 to 1985 and made numerous TV appearances, including one each on the Hitchcock show, The Twilight Zone and The Outer Limits. Comic book fans may remember him as J. Jonah Jameson on The Amazing Spider-Man TV series in 1978-79. "Guilty Witness" was anthologized a second time in Kill or Cure: Suspense Stories About the World of Medicine, edited by Marcia Muller and Bill Pronzini and published in 1985. The TV version is available on DVD here or may be viewed online for free here. "Amazon.com." Amazon.com. Web. 9 Aug. 2015. "The FictionMags Index." The FictionMags Index. Web. 9 Aug. 2015. "Galactic Central." Galactic Central. Web. 9 Aug. 2015. Grams, Martin, and Patrik Wikstrom. The Alfred Hitchcock Presents Companion. Churchville: MD: OTR Pub., 2001. Print. "Guilty Witness." Alfred Hitchcock Presents. CBS. 11 Dec. 1955. Television. Hershman, Morris. "Guilty Witness." 1949. Butcher, Baker, Murder-Maker. New York: Knopf, 1954. 149-62. Print. IMDb. IMDb.com. Web. 9 Aug. 2015. "Morris Hershman." Contemporary Authors Online. Detroit: Gale, 2001. Contemporary Authors. Web. 9 Aug. 2015. Wikipedia. Wikimedia Foundation. Web. 9 Aug. 2015. In two weeks: "The Older Sister," with Joan Lorring and Carmen Mathews! Wow! I've got that Morris Hershman paperback (great cover) and I never made the connection. Thanks! Did you read the book and, if so, do you remember it? I wonder how it compares to the story. No William Castle fan can forget Judith Evelyn as the neurotic mute woman who's literally scared to death in THE TINGLER (though I never realized she was in REAR WINDOW). I haven't seen The Tingler since I was a teenager! But I can't forget her as Miss Lonelyhearts in Rear Window. book sales, church X-mas sales and to a much lesser degree back yard sales. You don't see these anymore except for the yard sales and the don't sell books. And the copies you find don't usually smell very good, either! What doesnt make sense is why dorothy would have an affair with a man who beats his wife and also with other women as well. There's no accounting for taste! Thanks for reading and for your comment.